Once in a while, we will have a lot of troubles trying to stay healthy and in shape amidst the jam-packed business schedule. And it is not an unusual thing for many people, either. In fact, this struggle is ubiquitous to a major portion of the population now that our works had gotten busier. And in a commendable effort to be healthier and fitter, many people had chosen the fine sport of cycling to get their body back to shape. But while we’re talking about cycling, a lot of you might have the idea of cycling as a man hunched over on a normal bicycle pedaling away down the street. And you’re not entirely wrong. However, there’s another type of bike that most people must’ve seen once or twice in their life but never remembered much about it: The recumbent bikes. 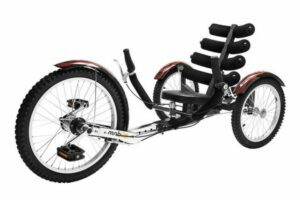 A recumbent bike is – as its name might have suggested wonderfully – is a bike that has a reclined seat that put the rider’s body angular to the ground instead of upright such as in the case of your average bike. Recumbent bikes have a great concept in mind: To take as much stress from the rider’s own weight pressing down onto the bike as much as possible. While the normal bikes that you see running down the street every day have the rider’s weight pressing down on three main points of contacts: His sit bones on the saddle, his hands doing the steering, and finally, his feet pedaling. But on a recumbent bike, the majority of the rider’s weight was put on his sit bone. Effectively spreading his weight evenly across the entire seat, and reducing the stress on the body. Beside the atypical bicycles with two wheels – front and aft – there’s also a variation of recumbent bikes that are much rarer, but considerably more interesting: The recumbent tricycle (also known as the trike, 3 wheel bicycle). And obviously, it comes with three wheels. When most people think of tricycles, they only think about the tiny trikes that children often play around with while they’re trying to learn how to ride a true bike. 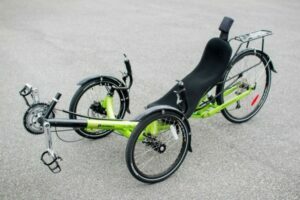 The thought can be discouraging and a little bit embarrassing to some, but once you read through the article, you can be proud to own an adult recumbent trike. The first type of trike is a delta trike. This is the type that most people immediately think of when someone mentioned a tricycle: Two wheels out in the back, and one wheel up front. The rider sits in a reclined seat and steers the entire thing using the steering connected to the front wheel just like on a normal bike. The second type of trike is much more peculiar: The tadpole trike. The layout of the wheels is flipped over completely: Two wheels up front to the sides and a single wheel out in the back. The method of turning is also different than the one up above. This type of trike needs two different ‘Headsets’ to turn the two front wheels to the rider’s direction instead of a traditional hand steering. Each design has their benefits and their respective disadvantages. But as for style and functionality, tadpole trike is a lead over the delta trike. Tadpole trikes are far more stable and faster thanks to its light design. They’re also easier to maneuver around on – such that you can get in and out of the seat pretty easily. Meanwhile, the delta trike being the obvious underdog in the competition won’t go down without a fight, either. These bikes are often separated into two groups: One-wheel drive, and two-wheel drive. For those that are in deeper into the community, the knowledge is passed around that one-wheel drive is much more inefficient and annoying than its doubled-up counterpart. As often, for a one-wheel drive, the wheel can pull itself to aside while accelerating or climbing, which can be an extreme bother to a lot of people. The cheaper delta trikes often have over-seat steering, which is a larger version of a bicycle’s steering leaning back toward the user. It is a lot less sporty, heavier, and more cluttering than anything. Overall, tadpole trikes hold a larger portion of popularity than delta trikes. But the fact that they tend to be more expensive than delta trikes have put a lot of prospect riders on hold about owning one. Just like any sorts of cycling else, recumbent bikes help you tone up the muscles in your legs with the pedaling motions. Particularly, they strengthen the hamstring to the stress of cycling over time, all the while building up the quadriceps in your thighs for stronger motions. It will also benefit your calves as you work your ankles to work the pedals. Where do your legs attach to? That’s right, your aft – or rear, whatever the word you prefer. While you’re brushing up your legwork, your rear, particularly your buttocks and hips, benefited from the exercise as well. The farther you pedal and the more frequent you do it, the benefits to these muscles will become more pronounced. When you actually sit back and think about it, cycling really has nothing to do with upper body work. Common sense tells us that cycling is pure legworks and nothing else. Due to its unique design, you will also need to exercise a few your abs to pedal the entire contraption moving. The seat gives you a sturdy foundation to lean yourself against and apply leverage to the pedals, exercising your abs in the process. Although it will certainly not be as efficient as curl-ups or specialized exercises, it still provides a certain degree of exercise. Expectedly, it also trims down your weight considerably by burning away the excess fat. By expending the calories you get from food with each cycle, if you do it regularly enough, you can reasonably expect a good reduction in weight in a month. However, it still won’t be effective if you don’t have a good and healthy diet in place. Burning away fat is one thing, but if you keep on replenishing the burned fat with even more fat. You will be quite frustrated to know that all the time you’ve been slaving away on the seat is for naught. Like I said at the beginning of the article when someone mentioned tricycles, a lot of people will think about the youth three-wheeled bikes. The Mobo Triton is for children, but it’s much more ‘Grown up’ than the plastic version you can find at the mall in the kid’s section. One of the thing that makes it stand out is that it’s tailored specifically for kids in mind: And knowing them, they would love more a good looking bike than a well-functioned one. The Mobo Triton balanced the two aspects out perfectly. The bike is crafted uniquely in metal and comes in various, exciting colors that can strike the eyes immediately. The ergonomics of the design is at the core of this Mobo Triton ultimate ergonomic cruiser review. One of the more exciting features is that it has a telescopic frame that can be adjusted to fit the child’s body type, from 3’8” in height to 5’2” to ensure that they have the best reach toward the pedals. The steering is connected to the rear wheels and can bolster the child’s hand-eye coordination as well as his/her arm’s strength steering the wheels. The pedals, of course, help with improving the legs’ strength. The seat is cushioned to have the best comfortability it can possibly afford, and its inclination also eases away the stress on his/her body. It is chainless to not be cluttered and prevent freak accidents such as slipping on the messy chains. Attractive appearance with multiple color options. Telescopic frame for a variety of body types. Some problems are reported with the assembly instructions. The Mobo Triton is a very well-rounded design that’s worthy of a birthday or gift of any occasions to your children if they’re the sorts that love the outdoors. It is certainly fun to play around on the trike, and they could live a healthier life while enjoying their natural energy that comes with youth. Now we come to the main attraction of this article: Recumbent trikes for adults. Besides the obvious health benefits, a trike is also the perfect way to be happier and more contented with your life living with energy outside of the door of your house. In this section, we’ll run you through a roster of our favorite trikes so far for you to have an idea of what you’re looking for in a trike. It has always been a fact ever since the invention of bikes that they can’t reverse like the car could. Instead, you have to manually use your legs to push back on the bike for it to move backward. But not with this one, and that is its most special feature that made it stand out so much. 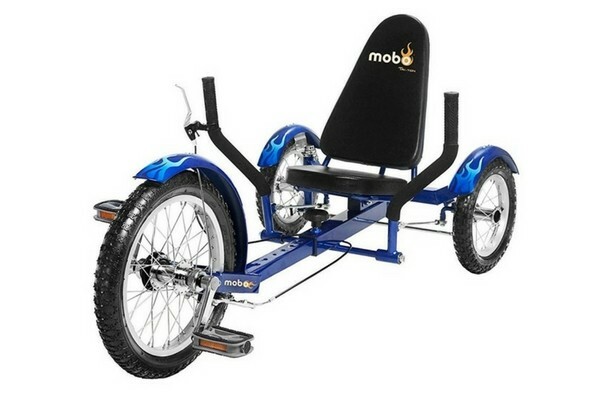 The Mobo Shift can do this through a special reverse-gearing function, you can both pedal forward just like an ordinary trike through your run. But once you need to reverse, unlike your average bikes, you only need to reverse your pedaling motion for the bike to push itself backward. Trikes are inherently heavier and less hospitable to motions that are not put on the pedals, so this is a life-saver and can be the perfect cure for annoyance to some riders. 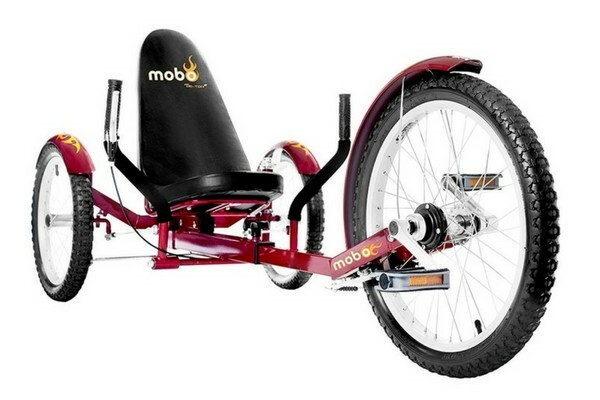 Besides the unique feature, the Mobo Shift has all of the features that set it in the same league as most other quality trikes. Including a telescopic frame that can be adjusted to fit the rider’s height and body size, from about 4 feet to 6 feet. The frame is also constructed of steel to ensure as much longevity as possible, and by that, I mean with good care, the bike can serve faithfully for years on end. Steering is handled by the two rear wheels and can be controlled through two handles right by the two sides of the seat. This design helps to build arm strength, and the ergonomic also allows for a smoother and more reactive experience than with a normal steer. The seat, of course, is cushioned and can be adjusted through a series of different angles for you to be most comfortable at the wheel. With all 6 settings in total, you won’t have much problem finding the best setting that works for you. The chassis is chainless, thus less cluttering for you to deal with. Tires can be worn out quickly. The reviews about the Mobo Shift are mostly mixed, however, most are positive enough that you should consider taking the plunge if you’re looking for a convenient trike. With the unique reverse ability, it allows you to be more comfortable and exercising to be more convenient while you’re out. Even though the price is high at $500+ for a unit, it is still worth a try. And in my view, all of the things it is made it more deserving of the price tag it was branded with than ever. If you have read the previous section on the children’s bike, this is exactly that one reincarnated into a more capable form to cater to the adults. By transforming the child-sized delta recumbent bike to take up a larger size and heavier user’s weight, the design is effectively adapted to serve the grown up. The trike’s frame is now able to receive rider from 4’2” to 6’3”, and just like its smaller sister, the frame can be telescopically adjusted to fit the rider’s body size. The front wheel can be considered oversize compared to other models of trikes. But this gives the rider certain benefits: It gives the overall design a lower center of gravity to make it more stable. And the larger wheel can grip the road’s surface better when you go off-road as a result. But needless to say, it also comes with a disadvantage: It obstructs your forward vision when you’re in your seat. This can be a problem you need to pay attention to the minuscule details on the road to avoid rolling over a pothole or having a shaky ride. There’s nothing to say about the seating: It is very comfortable and the recline takes enough stress out of your back for you to feel comfortable to be on the seat for a long time. The steering system is also similar to the kid’s version with the two rear wheels acting together and controlled using the handles to the sides of the seat. It can be slow for some people, as the trike only has one gear. The bike has its own share of problems with speed, but since it is aimed mostly at those with disabilities or is just having slow-paced, leisure rides through the city. And if that’s what you have in mind doing on a weekend, the Mobo Triton Pro isn’t really that bad of an investment. 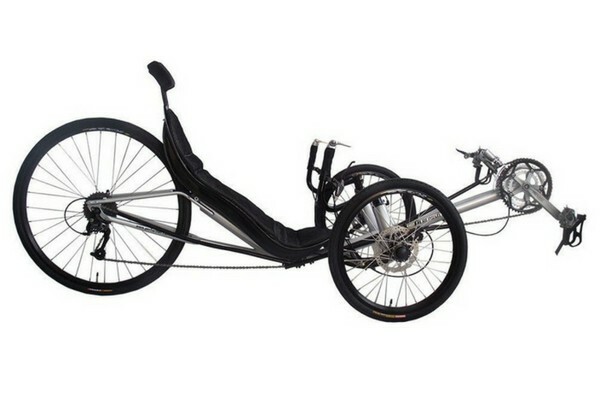 This tadpole recumbent bike is built for speed. Unlike the previous Mobo Triton Pro, the Performer JC70 has more extremes and expecting rougher treatments in mind. The rear wheel conforms to the 700C standard for maximum speed to be derived from it. And that is one of its sell-point. The JC70 gives a lot more speed than a lot of trike models on the market. The hardshell seat is padded with vented mesh to both ventilate your back that would be soaked with sweat and suffocating after a while and can get very uncomfortable. The JC70 provides excellent breathability, and as a result, comfortability in this section. Along with the headrest to dissipate the stress on your neck, excellent comfort is created. Maintenance and assembly are made easier since the entire package came with a basic toolkit to get you up and running immediately. They would also be useful later in the future when you need to whip up a quick fix or check-up once in a while. Through two handles at the sides of the seat, you can control the two front wheels for steering. Fast speed potential through a larger rear wheel. Expensive – along with the $1,300+ range that maybe won’t fit a lot of people’s budget. The Performer JC70 is a solid and strong design with almost no flaws to think of, it is worth the title of one of the best tadpole recumbent trike out there. Even though it should only fit those with a sizeable budget, you shouldn’t be hesitant to give it a try if you can. Unlike the previous JC70 recumbent trike that Performer released, the JC26X focused more on user’s comfort above anything else. Performance and everything else, the JC26X is similar to the JC70 in a lot of ways. In fact, it inherits all of the great things that make up the JC70 but with a few twists to make it better. One of the first thing that should be mentioned is the 700C’s standard-complied tire. As said, the larger rear tire provides better traction and grip on the road’s surface – thus making the entire experience smoother and more pleasant for the rider. Now, this is where the new twist of the JC26X came in: It has a strengthened rear suspension. The new add-on would make the vanilla experience with the rear wheel even more pleasant than it already is. But make no mistake, when I said that the JC26X inherits the best of the JC70 – that also includes the speed that made the latter stand out. With 27 speeds provided by 9 gears up front and 3 gears in the back, the trike can pull great speed once you push it to. The seat still holds the old design that made it so comfy: The hardshell, mesh-cushioned seat along with the headrest provides you with all of the support you need to spend a long time on the seat. The frame is made from Aluminium, a natural light but also strong material, which decreases the overall weight of the trike considerably. You also have options to mount a rear rack or a fender to the frame for better protection on the road – and the best thing is that they’re included in the shipping. No need for expensive extras on the market. Rear rack and fender included in the initial purchase. Much more expensive than the JC70, which is already at a quite uncomfortable price range. This is one of the best tadpole trikes you can find on the market with the best performance in it. The price can be, admittedly, sour, but Performer has made it so that it’s worth the money you’ve invested in greatly. If you’re very much into the sport and would like something that matches your passion with it, the JC26X is something you really shouldn’t miss out. Especially if you have the finance to back it up. Some consider these to be a novelty: The average trikes are a lot more expensive than the more streamlined bicycles. But the comfort and the exercise that they provide make them a much better candidate for your health regiment than an average bike. Whatever it is that you chose, we hope that this article had helped with your decision-making and that you have found it useful!